Once again, SpaceX will try to recover a very expensive part of its rocket after launching it into space. If SpaceX succeeds in recovering the first stage of its rocket after its 10:21 a.m. ET launch on Sunday at Florida's Cape Canaveral, it will be a historical achievement. It will push space travel further toward a future in which people, satellites and other items can be inexpensively launched into orbit. If it fails, SpaceX will learn from its mistakes and try yet again. SpaceX has made two previous attempts to land the first stage of its Falcon 9 rocket onto a platform in the Atlantic Ocean -- once in January and another time in April. Both attempts failed. Sticking the landing has proven extremely tricky. After reaching the edge of space, the first stage of the rocket is separated from the rest of the rocket. It goes on to fire gas thrusters to flip itself around, and it plummets back to Earth faster than the speed of sound. It then ignites thrusters to slow itself down, and it has to land vertically on carbon fiber landing legs that deploy right before touchdown. In the initial attempt in January, the first stage of the rocket ran out of hydraulic fluid used to steer itself. The second attempt was nearly successful -- it landed vertically on the platform -- but it tipped over after a faulty valve controlling engine power throttled down just a few seconds later than it should have. The company has made changes to its rocket that it believes will help prevent its valves from failing in the future. SpaceX is trying to recycle the first stage of its rockets, because the first stage alone costs millions of dollars -- about the same as a jumbo jet. "These landing attempts move us toward our goal of producing a fully and rapidly reusable rocket system, which will dramatically reduce the cost of space transport," SpaceX said in a blog post on Thursday. The company said the odds of success are "uncertain." In the past, SpaceX CEO Elon Musk has said chances are about 50/50. In May, SpaceX successfully tested a different rocket -- its Crew Dragon spacecraft -- in a flight that lasted less than 2 minutes. 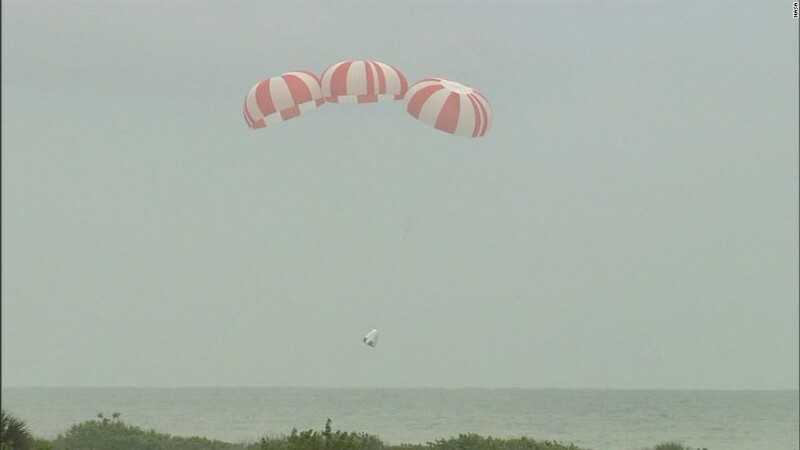 The test was meant to prove to NASA that the SpaceX crew escape system would work properly if there's an emergency during a flight with people on board. It's all part of the process of certifying SpaceX to become the first private company to carry NASA astronauts to the International Space Station. --Amanda Barnett contributed to this report.